For over 40 years, The Painswick Beacon has been telling the everyday stories of Painswick and Painswickians. The first Beacon was published in April, 1978 and it has been published since then on the first Saturday of each month. 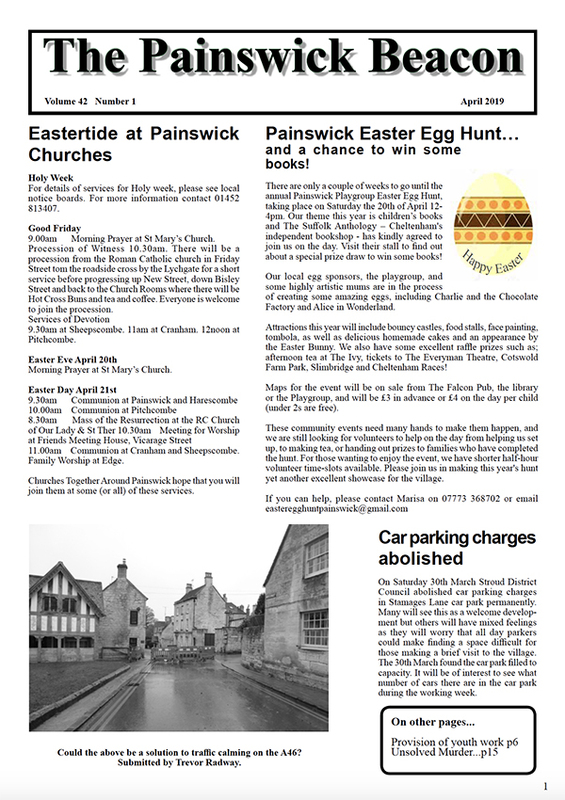 The print run of at least 1,500 copies is delivered free to every household in Painswick village itself, to subscribers in the neighbouring villages of Edge, Sheepscombe and Slad, and from pickup points in other villages. There are also around a hundred postal subscribers from elsewhere in the UK and around the world; from Bristol to Bangkok, Walsall to Warsaw and Malvern to Montreal. 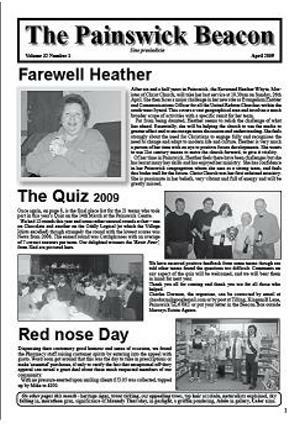 Regular features include Parish Council and planning news, news from local clubs and societies, a property report, sports, the village diary and the ins and outs, ups and downs of Painswickian personal lives in a personal column. All are available here, just click as required. The Beacon relies for its income on advertising from local businesses and voluntary subscriptions. Currently there are around 600 subscribers who contribute on average of £8.00 each per year. Producing the Beacon each month - typically 20 - 24 pages - is a team effort. All are volunteers - no-one gets paid - and each issue relies on editorial contributions from individuals and organisations throughout the community. As a public service the Beacon publishes a free annual Directory with monthly updates in this page. The Directory seeks to list the contact details of all enterprises and organisations within the civil parish of Painswick. Links offered on this page are as notified to us and limited by space to likely key contacts.